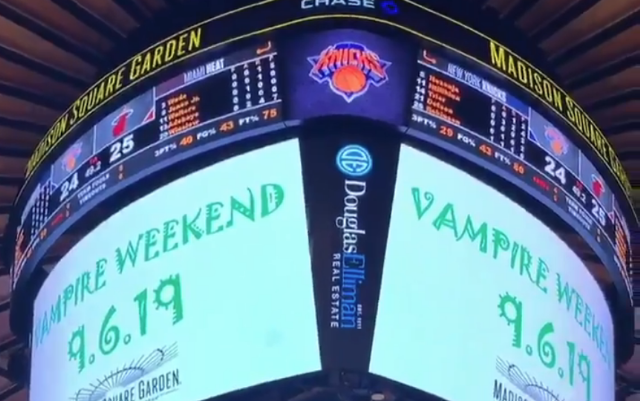 Last week, Vampire Weekend released the first two singles from their upcoming album Father of the Bride, which is reportedly due out in March or April. Previously, they teased “Harmony Hall,” which features contributions by Dirty Projectors’ Dave Longstreth, Danielle Haim, and Greg Leisz, by releasing two hours of guitar loops excerpted from the song. Listen to “Harmony Hall” and the Haruomi-Hosono-sampling “2021” here, and read our reverent review of “Harmony Hall” here. Check out footage of the MSG date reveal, and Koenig and Desus mugging for the camera, below.